FINALLY a low cost front BB (Big Brake) solution for your C5-A6-S6 or allroad with the 4.2L V8 that uses the popular Porsche Cayenne caliper that bolts right to your stock spindle with NO MODIFICATIONS! 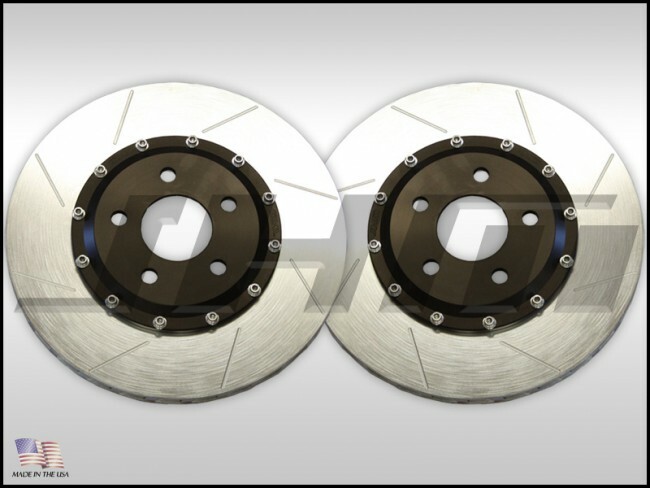 NOTE: These rotors require the use of Cayenne 6-piston brembo calipers to do this conversion. The price on this page is only for the slotted rotors only. We sell optional hardware and brake lines to make the swap easier as well. If you are interested in our FULL BBK, please see that product page back in this section. NOTE: For the A4s their rotors are even smaller so this upgrade would be even more substantial. Why the Porsche Cayenne caliper? With its 6-piston design and MASSIVE brake pads it is a strong performer. Also it bolts right up to your spindles with NO brackets. All you need is some bolts, nuts, brake lines and JHM rotors and you have a 350mm BBK. Being that it is an OEM part they are readily available and can be found used for great prices. INCLUDES: 2 - JHM 2-piece Lightweight Slotted Front Rotors. (Each rotor weighs 8lbs less than stock for a total of 16lbs weight savings.) 32% lighter! This is with a larger and thicker and rotor than stock(S4) to work with the Cayenne caliper! - Go back one section if you need a hardware kit for adapting the calipers to your car (bolts, washers and nuts). - Go back one section if you need need stainless brake lines that adapt these calipers to the C5-A6-S6 or allroad with the 4.2L V8. We worked closely with a race brake manufacturer that supplies many NASCAR racers and a couple major brake kit companies. Due to their expertise we chose to have them build us the outer rings to our specs to fit the C5-A6-S6 or allroad with the 4.2L V8 with a Cayenne caliper bolted on. 12 attachment points for durability and strength. Note - This brake upgrade only fits under most 18" wheels or larger. It fits stock 18" C5-A6-S6 or allroad with the 4.2L V8 wheels with a 3mm wheel spacer.